The scientific explanation for the change in day length is that the Earth’s axis is ‘leaning’ the Southern Hemisphere away from the sun slightly more each day until June 21st. The way we perceive the sun in relationship to ourselves is that it rises a little further northeast and sets a little further northwest each day, as well as hanging lower in the sky at noon. Mind you, this is gradual. It takes 6 months for the ‘tilt’ to change from the sun’s highest point in the sky – and longest day of the year – and its lowest point in the sky. A good eco-designer takes his of her lessons from nature. And nature takes his or her lessons largely from the sun. Using the transitive property, you can get the rest. In the space below, I’ll explain two examples of good eco-design that take full advantage of the predictable behaviour of the sun: one biological and one physical. 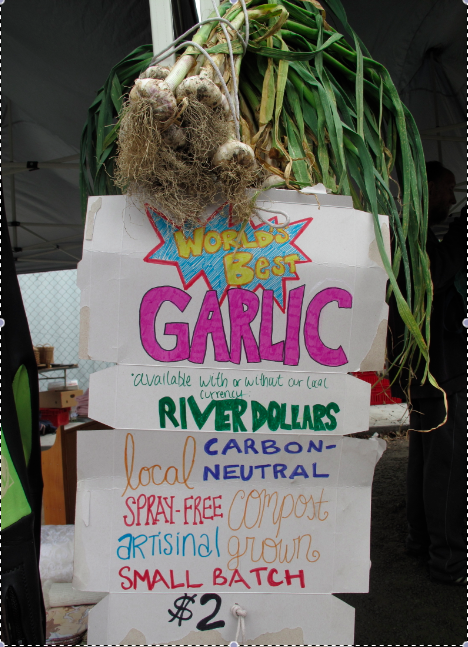 If you were at Whanganui’s Saturday market for its last session before Christmas 2012, you may have been among the lucky few to have purchased The World’s Best Garlic. There is a lot that goes into growing The World’s Best Garlic besides humility. One important ingredient is timing. When I arrived in New Zealand five years ago I was told: “Plant garlic on the shortest day of the year and harvest it on the longest.” Generally speaking, this translates into June 21st to December 21st. Please be aware, however, that this has nothing to due with full moons, cow poo vortexes, or Grecian Formula 44. It does have to due with soil temperature and gradually increasing sunlight day by day for half a year. Also be aware that growing The World’s Best Garlic involves the right kind and amount of compost, mulch, and watering regimen, all of which are highly protected trade secrets. The other example of good eco-design involves two examples of solar hot water that are dramatically different from one another but each serves its own users most appropriately. One system is set on an acute angle and one on an obtuse angle to the sky. In other words, one system is set up for maximum efficiency in the winter and one for maximum efficiency in the summer. 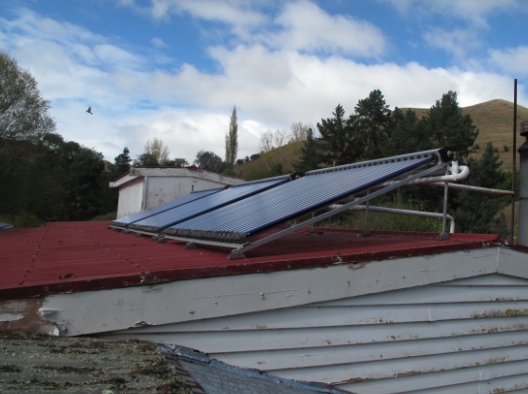 Solar hot water set for a winter sun. The solar hot water system on our home is set for a winter sun angle because we know that there are fewer total hours of daylight in winter, and that our insulated tank loses more heat each night in July than in January. There also tends to be more rain and clouds in winter, so we need to take advantage of every clear patch and fine day. Even set at this high angle, our system can boil over any given day of the summer if we don’t use enough hot water. This ‘boiling’ water shoots down the gully trap as a safety feature to the system. Solar hot water set for a summer sun. 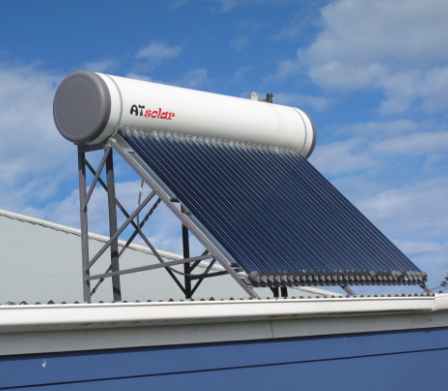 So who, you may ask, would set their solar hot water system for a summer angle when there are plenty of long, fine days. Answer: YMCA Central’s Raukawa Falls Adventure Camp. They get heaps of visitors all summer long, many of whom want a warm shower at the end of each day. But for much of the winter, the camp lays more or less dormant, and a back-up wood-fired hot water system can easily fill in when needed. As spring follows winter, so form follows function…if the design is good.